Keep more appointments, automatically. Appointment Reminder for Google Calendar is a breeze to set up, helping you avoid unnecessary no-shows. Meet your customers where they are, without changing your booking system. Already scheduling appointments using Google Calendar? Appointment Reminder syncs with your calendar and sends custom reminders by SMS, email, or voice message. Send automatic reminder texts to clients at any point before their appointment. Skip the time-consuming manual phone calls in the morning. Set up your Google calendar reminders to send automatic voice messages and save time for more important work. Voicemails getting ignored? Our Google email reminder service cuts through the noise and sends messages straight to your customers’ inbox. Once you've signed up for a free trial of Appointment Reminder, we’ll show you how to integrate your Google Calendar with Appointment Reminder. The process takes only a couple of minutes and anyone can do it. Our system will sync appointments from Google Calendar in real-time. We’ll add, update, or delete any changes that have been made. You're in total control of what you want your reminder messages to say. You can even have different messages for different calendars, and we’ll magically insert the date and time of the appointment into each. You’re ready to go! Turn on sending and your reminders will go out at their specified times. 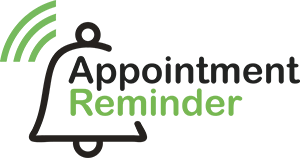 You can set the reminders for 24 hours before the appointment, 12 hours, 2 hours, 2 days before at 7pm, or any time that makes sense for your business. Customers can reply to your appointment reminder messages and you will be notified by email, SMS, or both. We can also update your Google Calendar to show that a customer has replied, along with their unique message. People are busy, and it’s tough to keep track of appointments. We're confident you'll increase revenue using our reminder system, and we offer a full money-back guarantee if you're not happy with our service for any reason.